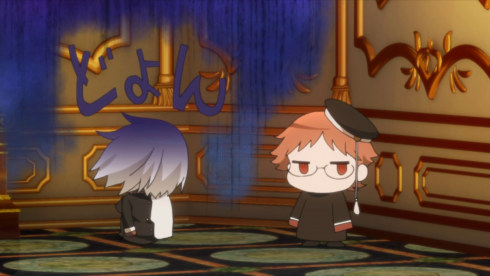 Last week, The Royal Tutor tackled more serious, introspective topics without quite knowing how to balance all that with its trademark cute comedy. This week it finds the balance and strikes it perfectly, telling a story that’s full of great gags (and chibis, glorious chibis!) while also finding space to talk about prejudice, social anxiety, and communication. It’s The Royal Tutor at its best, and its best is pretty darn great. The central arc is about Kai, and rest assured we’ll spend plenty of time on his predicament and journey this week, but I’d be remiss if I didn’t also point out that the week’s subplot–about Little Sister Adele getting into a “fight” with the family dog, Shadow–is also a delight. 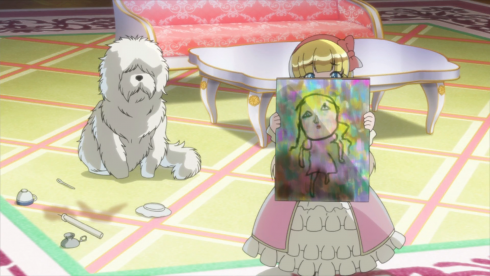 Adele is predictably adorable, just like the rest of her family, Shadow is the unsung hero, and Heine is the surprise catalyst, as it’s his “creepy” painting that sets off the whole kerfuffle. Adele’s spat with Shadow also gives the series an excuse to go to the zoo, which is everything I’d hoped for and then some. 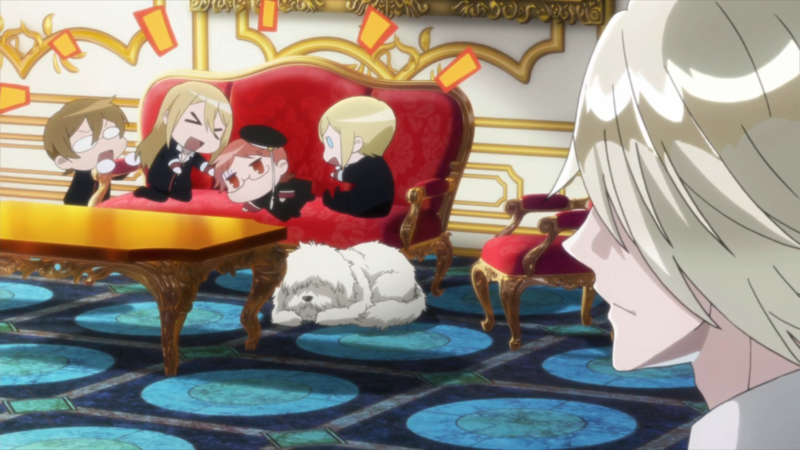 While I appreciate that The Royal Tutor wants to spend one-on-one time with its characters, the series really is at its best when its using its full ensemble and allowing them to play off one another, and this episode is no exception. 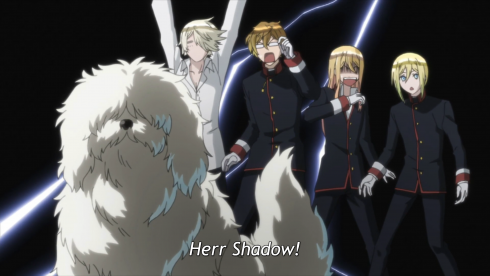 Everyone has time to be silly, whether its Licht getting hit on by a gay ostrich, Leo falling in love with a groundhog, poor Bruno trying to be popular with the bunnies, or Kai becoming one with a herd of sheep. The zoo really is fun for the whole family! And through it all, Heine and the brothers try their best to help Kai improve his social skills, with results both hilarious (that murder smile tho) and a little sad (I was definitely cheering “Come on, Kai! You can talk to the zookeeper!” right along with the boys, lemme tell ya). This is all handled with a light touch until they return to the palace, where Kai’s failures begin to stack up and seem to be actively causing trouble for the staff. Discouraged, the poor kid decides it might be better for everyone if he just gives up. Moooooom, the cute chibi show is making me feel things agaaaain…! Kai’s difficulties here are three-fold: It’s not just that he has trouble expressing himself (whether through speech or body language), nor is it just that his “scary” appearance automatically makes others wary of him. It’s also that he’s by far the most sensitive of the brothers, empathetic and attentive to other people’s feelings and forever seeking to make peace, whether that’s between his siblings or between himself and others. When he’s able to communicate properly, that high level of emotional intelligence makes him adept at conflict resolution (as demonstrated by the way he continuously cheers up Adele and subtly helps her realize how much she loves Shadow). 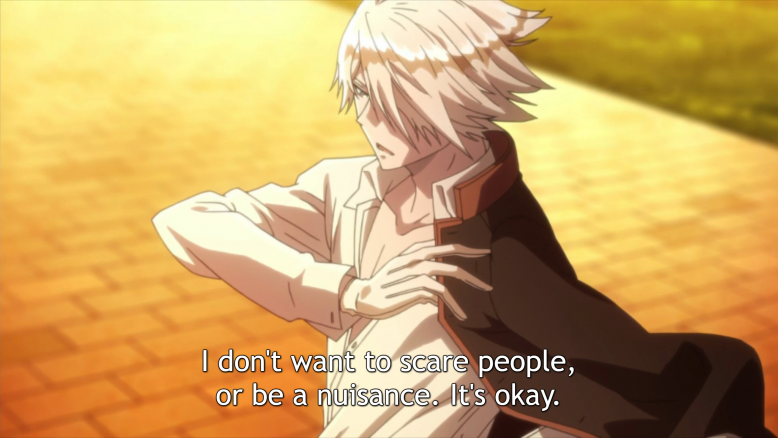 But when he isn’t able to communicate, it creates what Heine calls a “negative cycle,” where Kai is so (1) aware of the assumptions people make about him and (2) concerned about other people’s well-being that he’s too afraid to speak lest he scare them even more. He’s afraid of being feared, and that fear paralyzes him. Kai’s story is an important one, I think, with a lot of potential real-world applications. I imagine it will resonate with anyone who’s ever been judged by their appearance (i.e., most of us), and especially with those who have been on the receiving end of prejudice, assumed dangerous simply because of the way they look. 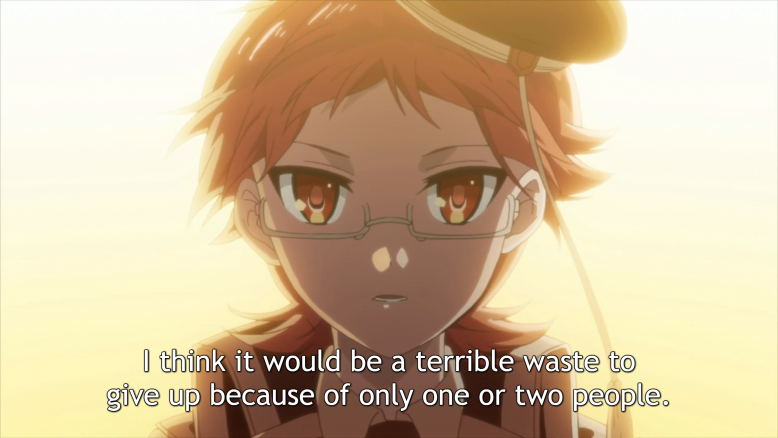 Like much of The Royal Tutor, it also serves as a reminder to the audience to avoid making those snap judgments, and to take the time to get to know someone before condemning them. On a smaller scale, Kai’s story is also for anyone who’s ever struggled with social anxiety or has difficulty expressing themselves to others. 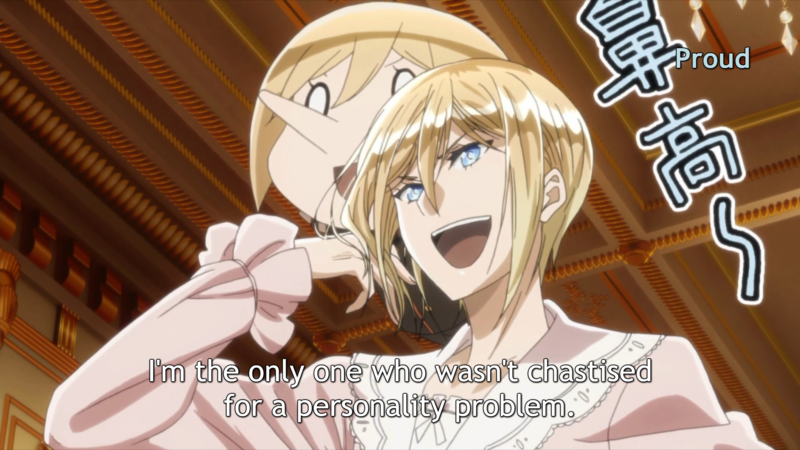 While The Royal Tutor is happy to poke fun at its characters (reminding us all that we shouldn’t take ourselves too seriously, I think), it’s ultimately sympathetic to their plights. True, the series acknowledges that poor communication skills are a weakness, but it also never blames Kai or acts like it’s somehow his fault that people are afraid of him. It takes the opposite approach, in fact, focusing on Kai’s own frustration and hurt. As a result, the humor surrounding Kai’s struggles gradually fades as we come to see that this is a serious problem rather than a silly quirk. He badly wants to get better at talking to people, and he has no clue how to do that. Like his brothers, he has an idea of where he wants to go, but he’s just not sure how to get there. 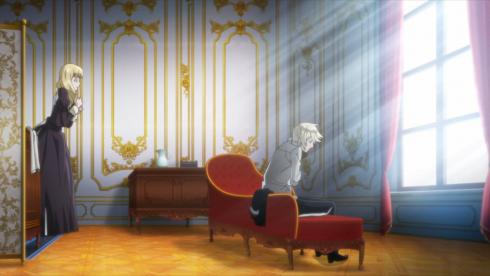 Where The Royal Tutor excels this week is in how it resolves Kai’s dilemma–because in some ways it doesn’t. 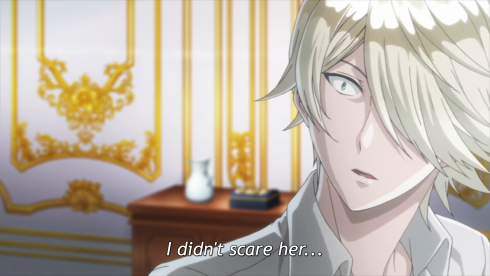 Kai will likely never be a natural flirt conversationalist like Licht, and the series doesn’t try to pretend there’s some magic switch you can flip that changes who you are. 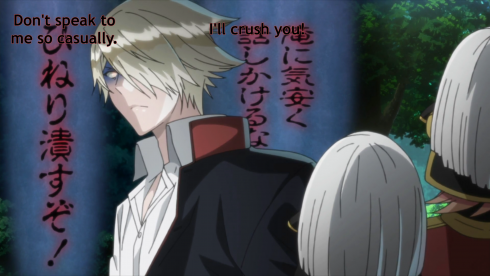 As Heine reminds Kai, it’s only been three days, after all. If there’s something about yourself that you want to improve, you absolutely can, but it’s a gradual process and you have to learn to be patient with yourself. Rather than jump straight to fake smiles or small talk, Kai needs to start with basic pleasantries. A simple “good morning” or “thank you” can go a long way, both for Kai’s confidence and his relations with others. Perhaps most importantly, Heine freely admits that’s sometimes understanding isn’t possible. There will always be people who make assumptions about Kai and never change them, no matter what he does. But the world is a big place, and there are plenty of other people who Kai will be able to have a meaningful connection with. No one can be understood by everyone, but everyone can be understood by someone. It’s that promise of possibility that encourages Kai to keep trying, despite the stumbling blocks he may hit along the way. There’s something beautifully inspiring in that message, I think, for the eloquent and the tongue-tied alike. It feels weird to say this eight episodes in, but I’m beginning to realize that The Royal Tutor is genuinely, legitimately good. I’ve been pitching it as a cute, light comedy, and it is that (and I love it for being that, too! ), but it’s not “just” that, either. It has something to say–about prejudice and privilege, about communication and understanding, about self-improvement and personal limitations–and it says it with charm and intelligence. 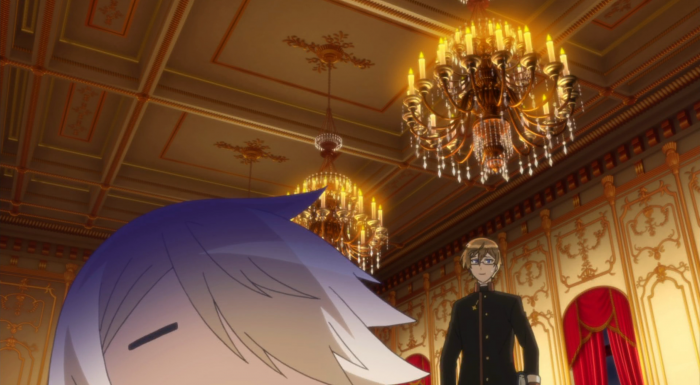 Okay, but what the heck was going on in Heine’s sitting room when Kai showed up at the end? Funny Bone Tickler: That shot of Leo crying “What is this?” while stretching out his hand to the groundhog will never not bring a smile to my face. This Week’s Lesson (#1): Speaking of Leo’s favorite animal, assuming it is a groundhog, they’re not native to (Fantasy) Europe, so it’s likely a zoologist brought one over from (Fantasy) North America. Hence Leo’s confusion and delight at this strange new critter. This Week’s Lesson (#2): Leo’s nose grows when he talks about how his dad didn’t scold him for “personality flaws.” This is because, in Japan, the mythological tengu is known for both its long nose and fierce pride, so a long nose is a visual metaphor for a proud or egotistical person (as opposed to here in the West, where it’s connected to Pinocchio and lying).